I'm not going to lie. It's been a rough couple of weeks. We've known how this was going to play out but when Marc-Andre Fleury handed the Stanley Cup to Matt Murray, it felt like the beginning of the end. In between reminiscing over old photos and crying fits, the Pens Initiative staff compiled our favorite memories, moments, stories, and musings of our Flower. (He'll always be "ours.") 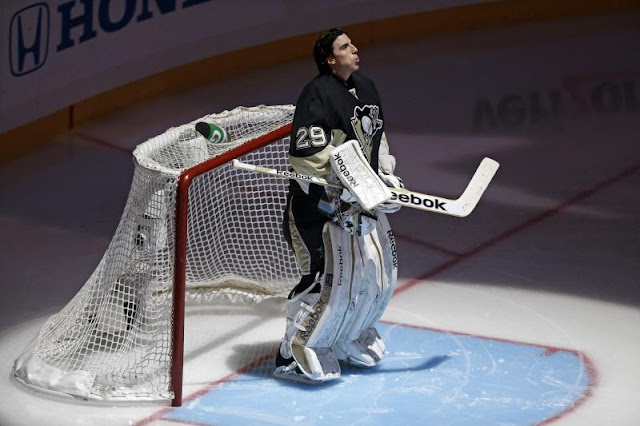 Please share your own thoughts about Fleury in the comments below, or on Facebook or Twitter. We brought plenty of tissues. I feel like I really got to know MAF during his awkward middle school years. It was big news when MAF showed up in WBS for the Playoff. This was the first real high end talent we had in WBS...like top shelf bottle of liquor talent. I surprised he even reported to WBS after he let in that terrible goal in World Juniors just a few days prior. He never really dazzled me in WBS, playing behind an AHL defense will do that sometimes. When he went up to Pittsburgh it was a completely different story and he looked incredible. I'm still surprised they let him wear his neon yellow pads with the blue jersey back then. It looked really funky. As a journalist you're always told to be impartial. You can't let feelings get in the way of your writing. As a human that's hard and people like Marc-Andre Fleury make that even harder. My meetings with Fleury were few. The Winter Classic, the All Star Game in 2012, after an Atlanta Thrashers game. These weren't the things that tied Marc-Andre Fleury to me. It was this day and age of media coverage, of hearing from people, of seeing the man behind the mask. It was the smile that belied the fierce competitor. It was the cartwheels that hid the champion that wanted more. It was the fun he had in net that shielded you from the hunger to be the best. Most of all, it was the smile and the fun that made him stand out from many other athletes. He was my draft class. He and I are the same age. We came of age at the same time. He's almost been my avatar. From the same way I play the game to the ages we are in real life. His draft was also the first one that told you that the Penguins were turning it around. Yellow pads, 40 plus stops, and raw athleticism in his first game was a glimpse at the next umpteen years. His first game summarized his career: the start of something special, the need for better. Fleury was the end of the X Generation. He was the beginning of the new generation. He was the start of our time. He was bright, shining, smiling the whole way. Every up, every down. In the end his story was his. It was one that he re-wrote as he left on top, his team on his back. His career ended the way it began. It was something special, stopping as much as he could going his way, as he needed better. Marc-Andre Fleury's loss will hit a lot of people in the gut. His first return will be tear-filled. He is tied to the Pittsburgh Penguins as he's re-written every record he could. No matter what jersey he dons, he'll always be in black-and-gold. He'll always be the start of a dynasty. He'll always be our generation. Marc Andre Fleury came to Pittsburgh during an era when seats were empty in Mellon Arena, and the Penguins fans were still confused about why we traded Jaromir Jagr for Kris Beech. The fans that once packed Mellon Arena were gone and the team was seriously considering moving to another city. A team as bad as the Penguins were had good draft picks, and Marc Andre Fleury lived up to the hype. To me, he was the face of the franchise before Sidney Crosby came along. Marc Andre Fleury has been through the lowest of lows with this franchise and now has seen his team lift three Stanley Cups during his tenure. I hate to seem him go, but it's best for him to find a team that will give him ice time. For those of us who have been around since the X-Generation (and prior to that), the departure of Marc-Andre Fleury is a little different than it might be for newer fans of the Penguins. That is not meant as a derogatory in any way, just as a point of fact. For the past several years, we as Penguins fans have been immensely spoiled with the team's success. Yet that X-Gen period of time had a huge impact on my - and I'm sure many others' - perspective of what to take out of the "7 years of plenty" we are currently enjoying. Many look primarily to Sid, Geno and Letang as the root of the Penguins success. But if you look back to that time, MAF was the beginning of the turnaround for the franchise. Here was this kid with the goofy smile (and later bold yellow kick pads) taken as the first pick of the 2003 NHL Draft. That smile. That goofy, infectious smile. We, as fans, had no idea what the future of this team held but in the midst of the misery, here was this kid that just enjoyed being here. The future Marc-Andre led the team into - every bit as much as the aforementioned superstars have - are why this fan-base, community and blog exist today. And that smile is still there. Regardless of what the future holds for Marc-Andre Fleury, his beautiful family and anybody who is associated with him, the Penguins' present is owed largely to him. He's never let the franchise or the fan base down. His strength of character, pure enjoyment of the game and his team-first mentality which led him to waive his NMC are ingrained into the DNA of this team and its fans. All of that is why MAF moving on from this team means so much more to me than any Fleury/Murray angle that people discuss today. 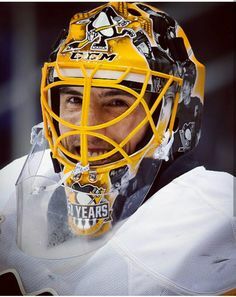 MAF made it okay to smile again. And, in a small way, MAF, in his handling of interviews since raising his third Cup, has made it okay to cry again as well. My one true hope is that Vegas - who will take Marc-Andre - treats him well. He helped to set one black and gold franchise on the right path. Of all the players available in this Expansion Draft, he's the one that the fledgling franchise can be assured will always remain an epitome of class and character, regardless of the fact that he will always be a Penguin to us. This is going to sound unkind, but the first thing I thought to myself when I laid eyes on MAF in his debut in Pittsburgh was, "Who is this lanky, horse faced kid? He looks more like a poet than a goalie! Look at his eyes! There is no intimidation in them!" I was never so happy to be wrong in my life. Over the next 14 years, the shenanigans, pranks and bright smile of MAF became staples fans and media looked forward to each season. With Slap Shot being my favorite sports movie, it brought me immense joy to see the Penguins having a little fun, and recreate the opening scene: the goalie interview. MAF played the part perfectly and did his best to stay in character the entire time while trying not to burst into laughter. Alongside Dan Potash and that wig with the badly taped on sideburns, I understood how keeping a straight face would have been difficult. Marc Andre may not be remembered as "the guy" for this current era of the Penguins but, he was and always will be the "right guy" at the right time. His jovial personality and otherworldly athleticism at the position was in many ways a mirror image of the unjaded youth and generational talent the Sidney Crosby era ushered in. And, just as the two generational talents that have now carried the franchise to three Stanley Cups struggled with the weight of expectations and missed opportunities, so did Fleury. The talent never went away though, as well as that..." level"....Fleury could get to. This past year's playoff run was an enjoyable smirk-inducing reminder of the franchise worthy talent Fleury is. God bless him! God bless him for having enough fortitude to overcome whatever personal anxiety, inconsistent focus, or positional blunders that occurred between 08-09 and this year. God bless him for not making a scene during any moment of his stay here when things weren't going well. And God bless him moving forward, because he deserves it! It's impossible to keep sports and emotions separate. I've been watching hockey for 25 years now and no group of players have ever endeared themselves to this city like the team we have now. The Penguin's "Core" group of Crosby, Malkin, Letang, Kessel, and ... Fleury is losing it's longest tenured member of this beloved team. I'm not going to recall history or laud over his achievements or his polarizing mark in Pittsburgh folk-lore. Marc-Andre Fleury is one of the most rare of humans in existence. He is selfless. The Flower did not HAVE to waive his NMC for Vegas. He did not HAVE to talk to management to make sure that both sides agree to an amicable release. He did not HAVE to put the team first, a team that has told him that they no longer need him. He is going to uproot his family, leave his friends, and the city who has been a strange mix of love and criticism to go to a team that is almost certain to struggle for the remainder of his contractual obligation. Marc-Andre Fleury did all of those things not for himself, he did it for his team and this city. I will never forget this valiant act of sacrifice. I will always support someone who in the face of difficulty makes the right choice. We owe Flower a debt of immense gratitude and undoubtedly be remembered fondly. The Flower was already pretty established when I seriously began following Penguins hockey in early 2008. The first thing that stood out to me was his aggressive and acrobatic flair in net. Whether it was a cross-crease split save or a massive windmill robbery, he always brought me out of my seat. His style and passion for the game is what got me back into playing net myself. To this day I still watch his highlights before most games. He's by no means my favorite goalie in the league (that's a tough contest between Jonathan Quick and Sergei Bobrovsky) but is probably my favorite personality in the league. There are so many moments from interviews, documentaries and games that I will always remember but my top highlight is from the 2011 Winter Classic. In the clip below Flower tells Jordan Staal that he is going to lose the practice shootout and then he proceeds to shut him out forcing him to run to the top of the stadium at Heinz Field. The energy and fun that this man brought to the Penguins for more than 10 years will never be replaced. Snap Snap, Flower... Snap Snap. For most or Fleury's tenure, I was living in a hockey desert (Georgia) or hostile territory (Philly area). I tried to keep up with the team as best I could as the internet was improving. Even from afar, Fleury was always one of my favorites. While his acrobatics in the net make a lot of people nervous, I've always been impressed by his athleticism and ability to get across the crease to make a play with his toe. He's not the smallest goalie, but he doesn't have the height advantage like say, Ben Bishop. This postseason a lot has been said about Rinne's ability to play the puck out of the net, but I think Fleury belongs in the same conversation. And his poke check? He could teach a clinic on that alone. I haven't been to a ton of games, but one of my favorites was a home game against the Islanders in March last year. It ended in a shootout, which is where Fleury does some of his best work. I had seats behind the goal and was so thrilled to see the Flower emerge victorious. Hyperbole aside, it was an awesome game and I was glad I was able to witness in person Fleury at his best. There aren't enough words in our vocabulary to describe how great Marc-Andre and his family are. He and Veronique have known each other since their teens. I was on the train in Boston when I read about their donation to the Boys and Girls Club and I had to put my head down and hide my face so no one could see me crying. It's going to be so hard to watch him blossom somewhere else. Vegas, or wherever he ends up, doesn't even realize what kind of player, teammate, and person they're getting. I look forward to hearing what kind of pranks he has up his sleeves for his new teammates. In 2003, Marc-Andre Fleury became Pittsburgh's first #1 overall draft pick since Mario Lemieux, thus making him the franchise's hockey equivalence of "Star Wars: A New Hope" for Penguins fans. Even when the team was mired with a horrible roster (Rico Fata, WOOF), Penguin supporters were angry that management kept denying Fleury the opportunity to stay up with the big club. Of course, ownership was doing Fleury a favor: he had little to gain by playing behind that horrible roster other than bruises from facing an onslaught of opponent fire with little chance of a reprieve. But when the Penguins started to amass other pieces– Evgeni Malkin, Sidney Crosby, Jordan Staal– suddenly Pittsburgh had something going, and that "something" resulted in back-to-back trips to the Stanley Cup Finals, and ultimately, the 2009 Cup Championship. Fleury was part folk-hero at that point, and his noted playoff struggles in the next five post-seasons clearly bothered him, and even his most vocal supporters (like me), were frustrated with his play. The low point for Fleury came in 2013 when the Pens replaced the shell-shocked Flower with Tomas Vokoun. Vokoun played extremely well in relief, further cementing the idea that Marc-Andre Fleury had the playoff yips and could not be counted on in spring. So when it was #29 that sprinted onto the ice before Game 1 against the Columbus Blue Jackets this spring, you can understand the consternation that many fans experienced, believing that things were over before they started. Instead, Fleury wrote his own final chapter, playing at a Conn Smythe-level through the first two rounds and propelling the Penguins into the Eastern Conference Finals where, in cruel fashion, he was removed from the net following a total team collapse against the Ottawa Senators. Fleury would not reclaim his crease, and was on the bench as presumptive franchise goalie Matt Murray finished off the Nashville Predators for Pittsburgh's second straight Stanley Cup Championship. Still, Fleury hoisted the Cup before handing it off to Murray, a symbolic changing of the guard and acknowledgement that the goaltending duo had worked as a singular unit to win. Fleury's legacy will be that of a consummate teammate, well-mannered on and off the ice, whose playful style and demeanor resonated with fans. My greatest Fleury regret will be that he never managed to score that empty-netter. I wish he had scored that goal, because the Mellon/Consol/PPG Paints Arena roar would have been greater than any other in team history.